The Uniting Church building in Tulip St was originally the Presbyterian Church, built in 1893 on land purchased for 50 pounds sterling from John Stivey. The original manse bought in 1900 was demolished about 1960 when a new manse was erected. 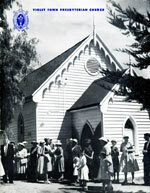 The hall portion was originally the Karramomus Church about 1950. The Methodist Church, which was sold for removal, was situated opposite Violet Town Motors in Cowslip St. The first services of the Presbyterian Church were held in a slab hut in Primrose Street for some time. Services were later conducted, first in a building near the then police station, until the Friendly Societies Hall was built. The Rev. J. Gilsennon was the first minister appointed to the Violet Town charge in 1885. The following year the work of the church spread to surrounding districts. The clergymen who officiated at St Andrew's were in the following order, as far as can be ascertained: Revs. M. Gilsennan, Walker, Attwood, Ride (now at Seymour, and during whose term the Manse was built), Chamberlain, Reid, Johnston, Thomas, Lee, Norris, Miles and Ray. During the ministry of the above gentlemen the charge was a Missionary Station. It was decided to form Violet Town, Stony Creek and Moglonemby into a full charge, and the Rev. T. C. L. Goble was the first ordained minister. He resigned, and for some months the pulpit was supplied by visiting clergymen from Melbourne, and now Rev. G. Martin is in charge. Mr T. Turnbull was secretary for 10 years, and Mrs. Turnbull was organist. At present the secretary is Mr. D. McKenzie, and Misses Mitchell, Meyer, and Martin act as organists. 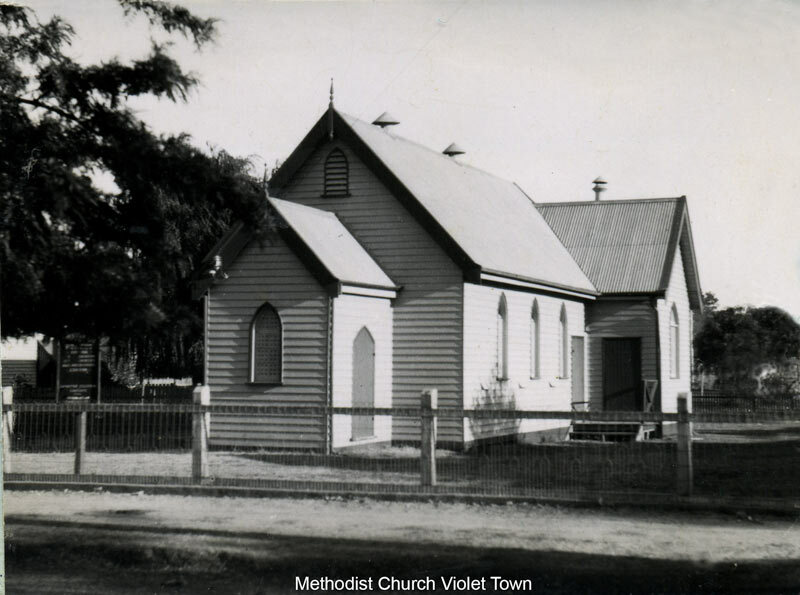 Services are held twice each Sunday at Violet Town, and fortnightly at Stony Creek and Karramomus. In December 1860, the Quarterly Meeting resolved that Mr. Walton be allowed one Sunday a month for Violet Town and Euroa. Whether services began immediately or whether they began and were discontinued, is unclear. In 1866 the records disclose that the Weysleyans also built a chapel in Crocus Street. The land was presented by Mr. Hillias. Prior to 1877 there was a small Wesleyan Church building between Mr. Field’s and Mr Stow’s, but for some time no services were held. On Mr. Mordecai Wilson’s appointment to the school in 1877 he sent a request to the minister in charge at Benalla that services be held at Violet Town. This was not practicable at the time. 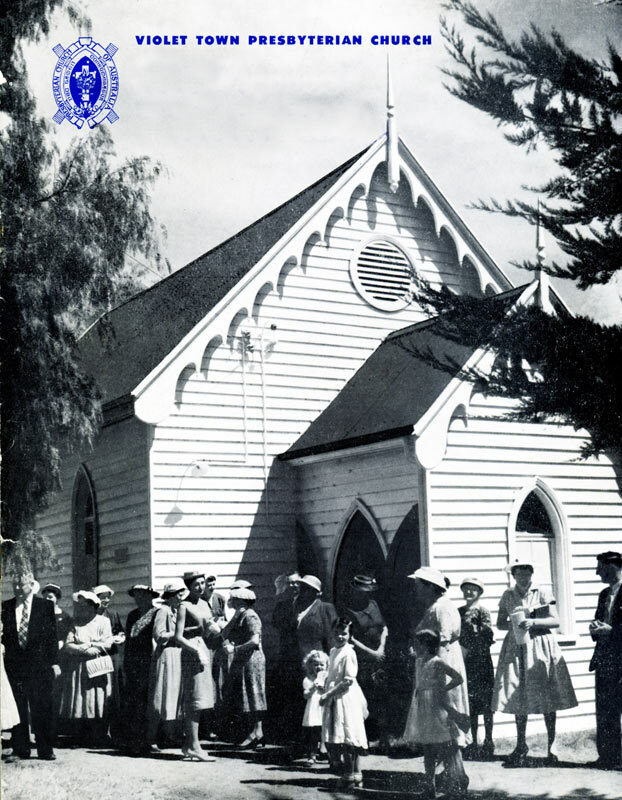 Then, a request was sent to the minister of United Free Methodist Church at Shepparton; this was acceded to, and the services were conducted by Rev. T. A. Bailey, early in 1878. Mr. Bailey, who was nearly 80 years of age, used to ride on horseback from Shepparton, over the bush tracks, conduct three services, finishing at Violet Town. For some time the services were conducted in the school, but after a time permission to use the building was cancelled, and the late Mr. S. Fenton generously offered the use of a large room at his house for Sunday evening services. 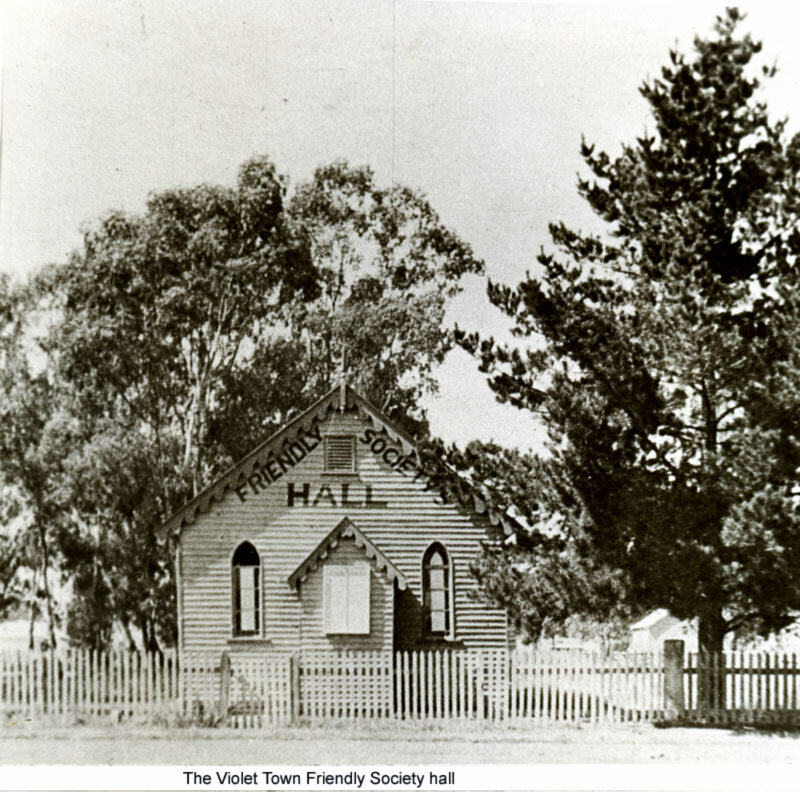 Steps were taken to form Violet Town into an independent circuit and build a church, and the site of the present Friendly Societies Hall was secured. The Rev. William Dixon was the first minister, and having been an architect prior to entering the ministry, he supervised the erection of the church building in 1880, now known as the Friendly Societies Hall. The opening of this new church was celebrated by a tea and public meeting. Since then services were regularly held, the ministers usually remaining three years. In 1908 a new site was purchased and a new church built on the present site. Ecumenical services held on 5th Sunday of the month.